You must be a member of the Marbella DinnerNations Group to attend this activity. Would you like to join this group? 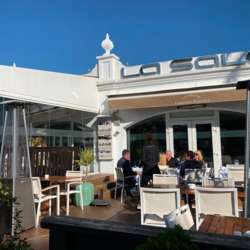 This one is a delicious 3-Course Lunch in a glazed sun trap restaurant, (on the left of the picture), just down the road from the Nueva Andalucia Bull Ring and Centro Comercial. This is DinnerNations Marbella first effort at a lunchtime event! If it is popular, then we may try one evening and one Sunday event each month, to suit more members. Price seems very good for 3 courses, drinks extra as usual, charged to each table of 4. If we get a waiting list, we can probably fit in more tables!